in the marketplace. Like so many other types of outerwear, choosing a fleece jacket or vest really comes down to one question: how will you use it. For example, do you need a light fleece pullover or jacket just to wear in the office when the air conditioning is just a little too cold for you? Do you wear fleece as a part of a layering system that will be worn with a lighter or heavier jacket? Do you need a thick fleece jacket to wear under overalls at work? Or do you perhaps need a fleece vest that will be worn over a jacket or insulated base layer? As you can see, these and many other situations will determine what type of fleece you choose. However, we can give you a few tips about the features you should pay attention to when selecting the right fleece jacket or vest for your situation. Fleece may have a few disadvantages as well. One is that fleece usually generates a lot of static electricity and also more prone to pick up smells, lint, hair and bacteria than a jacket with a smoother exterior. If you buy a cheaper fleece, you will also notice that it generates more pills, or small clumps of fleece that stick to your shirt and just about everything else. e because the tighter density repels more and acts as a much smoother surface. Therefore, expect fewer pills, more water resistance and better insulation. Lower density fleeces will be more porous, meaning less insulating power and also a rougher exterior that can snag easier. 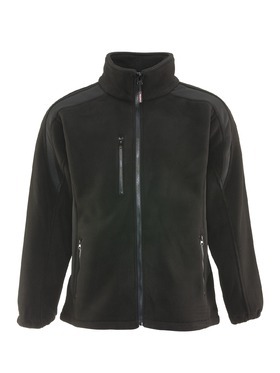 RefrigiWear developed such a high-density fleece for our garments called RefrigiFleece to improve durability and warmth. Because of the high-density design, RefrigiFleece jackets and vests will provide more insulation, be less prone to "shedding" and stand up to bumps and snagging over time. RefrigiFleece can be a 400-gram two-layer bonded fleece for more warmth or a 280-gram two-sided fleece for more casual, cooler temperatures. Outdoor activities or working in a cold environment can vary depending on whether water and wind are involved. In general, fleece can keep you warm but it is not water or wind proof. That's why many people choose fleece as a mid layer to add an extra layer of insulation. We find customers combining fleece as a mid layer with softshell jackets or lighter weight outerwear like our Chillbreaker garments. Fleece vests are popular with those working or playing in more temperate climates. Vests are often worn over long-sleeve shirts or sweatshirts, depending on the temperature. As long as the environment isn't very wet, fleece vests and lighter-weight fleece jackets can be very versatile and worn from Fall through Spring.